At the 2015 meetings of the conferences of the parties to the Basel, Rotterdam and Stockholm conventions, the Secretariat organized a Contest “BRS Practitioner” that culminated in ceremony that took place on 13 May 2015 when winners were announced. More than 150 delegates participated in the contest during the triple COPs. Through its technical assistance programme the Secretariat thrives to outreach parties and other stakeholders to support them in the implementation of the Basel, Rotterdam, and Stockholm conventions. Various tools, including face-to-face training activities, webinars, projects, are used to address needs of parties, strengthen their knowledge on specific issues and provide a platform for sharing and exchanging views, best practices and lessons learned. Between May 2013 and April 2015, 1700 people participated only in face-to-face trainings and workshops. The feedback from those who participated in the technical assistance activities is vital for the Secretariat in its efforts to better serve parties to the three conventions. Comments collected through the Contest demonstrated how the participants were able to apply knowledge and skills acquired through the training activities in their jobs, thus assisting them with the implementation of the specific obligations under the conventions. One of the winners said: “I used knowledge gained at the webinar on the Ban Amendment to assist in drafting a Cabinet submission for the country to accede to the Ban Amendment to the Basel Convention. The submission was tabled to the Cabinet and my country will be acceding to the Ban Amendment and depositing the instrument in short time." 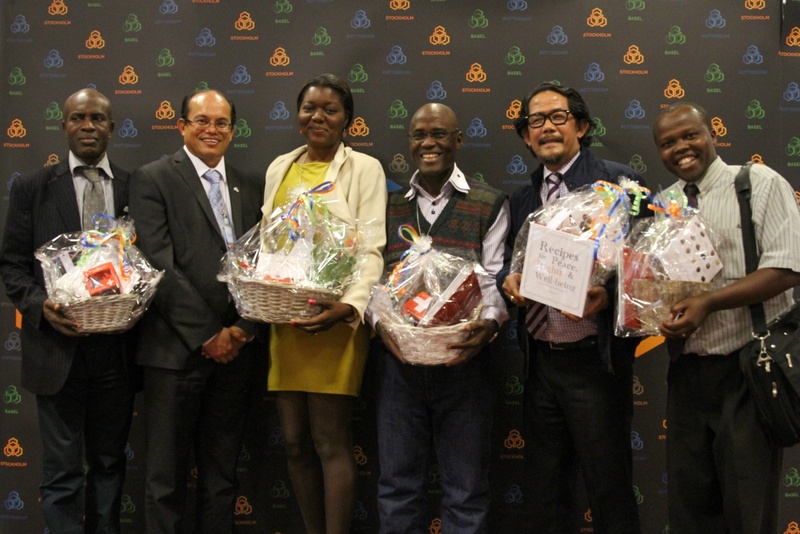 Winners of the BRS Practitioners Competition (L-R): Adefemi John Adegbite, Nigeria; Rolph Payet, Executive Secretary, BRS Conventions Secretariat; Andrea Jones Bennett, Jamaica; Gustave Sahouo Bedi, Côte d'Ivoire; Geri-Geronimo Sañez, Philippines; and Elijah Ruttoh Chebet, Kenya.